Goldfish Ghost, written by Lemony Snicket and illustrated by Lisa Brown, is the tale of a dead goldfish. Yes, you read that right. 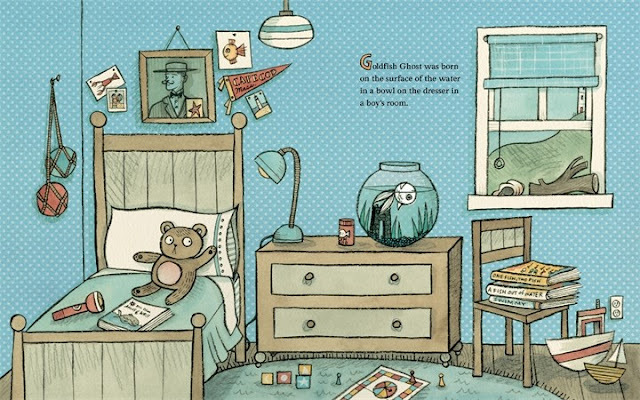 It's the story of a dead goldfish who sets out to find out who he is now that he's in his current state, and the humor with which Snicket and Brown tackle this bizarre story is laugh out loud funny. 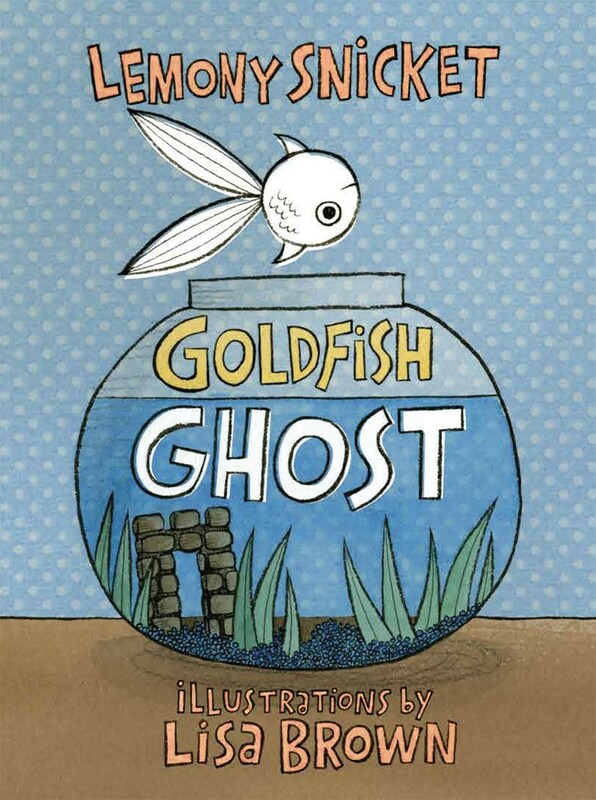 In Goldfish Ghost we meet a fish who has recently died in his bowl. Goldfish Ghost -- as he is dubbed from the moment of his "rebirth" -- quickly realizes he is lonely and sets out in search of companionship, floating out the window and through the neighborhood. Unfortunately for Goldfish Ghost, though, no one really pays attention to ghosts and he continually finds himself far from curing his loneliness. And despite his resolve to just return home to the bowl he was born in, he finds himself ousted by a new undead fish. Goldfish Ghost is without a home and without a friend. Until, that is, he hears a mysterious voice coming from the town's lighthouse. The illustrations are India ink and watercolor on paper, so there's a richness and vibrancy to them that jumps right off the page. Goldfish Ghost carries out his search of friends by always moving left to right, floating from one side of the book to other in a forward motion. Even when he comes upon a giant pod of sea animal ghosts who are going right to left, he stays his course. 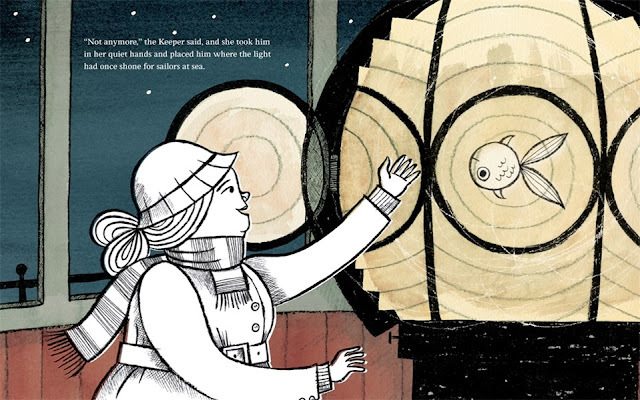 Only twice does he ever even face the left side of the page, and they're both significant moments: one when he returns home to find the other fish has taken his place and again when he meets the old lady in the lighthouse. He only looks in the less safe direction when he's in a pivotal moment of self-discovery. I mean, we already knew Lisa Brown is a genius, but this had me flipping through the pages for over an hour! Goldfish Ghost publishes exactly a month from today, May 2, 2017, from Roaring Brook Press!